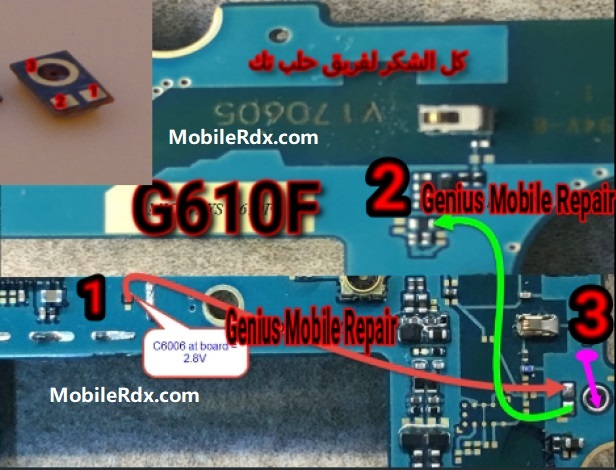 Hey Mobile Technician We Have Tested 100% Working Samsung G610F Mic Problem Jumper Ways Solution Only For Our Best Cellphone Technician,We Give You This Solution In Few Working Method So Follow Our New Samsung Galaxy J7 Prime G610F Mic Problem Solution Jumper Ways Circuit Diagram Our Team Hard Working To Find Problem Solution Of Brand Mobiles Or Other Chinese Clone, Make More Money With Us. In Samsung Galaxy J7 Prime G610F microphone is soldered to the motherboard. The mic is responsible for sending your voice to the person on the other end of a phone call, recording sounds while making videos or simply using voice recording apps. So if the other person can’t listen to your voice during a phone call you are going to have to change the microphone with a new one. So Follow Few Working Steps For New Samsung G610F Mic Problem Solution. Check Mic Open Mobile Menu >Apps>Voice Recorder After Run Voice Recording App On Mobile Click On Record Button Then Record Your Own Voice For Testing Mic Of Samsung SM-G610F If No Voice Record /so Technician Sure To Mic Problem. For Repair Mic In Hardware Tear down Or Disassembly Samsung Galaxy J7 Prime With Supported Tool. After Clean PCB Layout Of Samsung Galaxy J7 Prime G610F Then Check All Related Circuit Diagram And Related Components Like Fuse,Coil,Capacitor. So Don’t Worry About Circuit Diagram Of New Samsung Galaxy J7 Prime G610F Mic Related Follow Our New Samsung Galaxy J7 Prime Mic Related Traced Circuit Diagram In Below Figure. Every repairing solution posted here is tested by at least one member of MobileRdx.com team. Use the information available here at Your Own Risk. We are not responsible if any harm comes to your device during the repairing process.